In August I posted an entry titled The Prophetic End of Damascus. The entry covers what Isaiah 17:1-14 and Jeremiah 49:23-27 state will be the future of the longest existing city in the world — Syria's capital Damascus. The Bible states that Israel will destroy Damascus in a day, with such force that a nuclear weapon seems the only probably method. 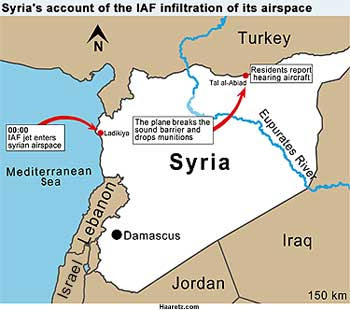 With all that is going on in the news as of late, why would Israel target Damascus instead of say Iran's capital Tehran? After all, Iran is the country hell-bent (literally) on building a nuclear weapon as fast as it can to "wipe Israel off the map." Why would Damascus be targeted first? An October 6, 2008, article from Joseph Farah's G2 Bulletin reported on WorldNetDaily may have the answer. It would appear that while the world is focused on Iran building nuclear weapons, Syria is the country "acting as a covert channel for Iran's program, and it may be getting help from North Korea and elements of Pakistan's A.Q. Khan nuclear network." What this means to Israel, then, is that Syria is most likely the greater of the nuclear threats to its survival. With Iran and North Korea setting up their nuke shops in Syria, Damascus would have to be removed by Israel to eliminate their greatest potential threat. According to the Bible, Damascus will indeed get a nuclear bomb, but it won't be one that they have made or want. In your previous post, you wrote "...Russia and Iran are stepping up their alliance with each other and other anti-Western nations like Syria and Venezuela. Their desired outcome being, for those who know what the Bible calls the Gog-Magog Invasion of Ezekiel 38/39, is to attack and destroy Israel." If Syria is to be part of the invasion of Israel in which God supernaturally destroys the invaders where does the nuclear attack on Syria fit in? If God destroys the attackers supernaturally, why would Israel have to nuke Syria? Could it be that Syria will be nuked prior to the invasion on Israel and that is what prompts the invasion? I'm confused. Can you clear this up? Thanks. Hi "Anonymous" ~ until Nathan or David get a chance to clear it up for you, I'll give my 2 cents' worth... yes, that is the way I see it: Is. 17 *FIRST* ... because basically Syria will NOT be a part of the formation of Gog/Magog war (Ez. 38/39) So, IMO, yes, it will be the destruction of Damascus that will make the world blazing mad at Israel! ~ thus, prompting the eventual Gog-Magog war. Interesting times! I thank you, David & Nathan, for updating this site every single day now! Looks like we're ready for a SOON rapture flight! Bill Salus' book Isralestine offers a theory based on Psalm 83, that Israel's surrounding nations attack and Israel is forced to annihilate Damascus in defense. This battle would proceed the Ezekiel 38-39 Gog-Magog Invasion of Russia-Iran. Both battles would be after the Rapture. The book's a good read and Bill's theory seems logical. I also tend to agree with Bill Salus' position on the Psalm 83 conflict. It seems logical that the destruction of Damascus will be tied to this Psalm 83 event. This will occur before the Ezikiel 38-39 battle.